Arguments are hard. Fighting is not something that any couple likes to partake in, though inevitably, it affects every couple at one point or another. If you are the one who has upset your girlfriend instead of vice versa, there are some key ways to apologize to your love. Apologies can be tricky—humans are stubborn and sometimes an apology comes too late to make a difference. That is what you would like to avoid. So without further delay, we bring you 10 ways to apologize to your girlfriend. The first and arguably most important step is to actually tell your girlfriend that you are sorry. Though it may seem simple, actually saying the words “I’m sorry” can make a huge difference—especially if you apologize in a timely fashion. As a society, we build up arguments and apologies to be a huge deal, but in reality, the words “I’m sorry” can go a long way. If you have yet to say “I’m sorry,” say it as soon as possible. If you cannot get your girlfriend’s attention enough to apologize, make sure she is aware of your intentions. Saying “I’m sorry” is easier when you have your girlfriend’s ear. Saying “I’m sorry” is huge, even though it seems simple, but it is more effective when you have someone’s full attention. If your girlfriend will not give you the time of day, make sure she knows you wish to apologize and not argue further. Though a simple “I’m sorry” can go a long way, it will be helpful if you can explain your actions to your girlfriend. Do you have a good reason for doing whatever you did to upset her? Do you have a solid explanation to share with your partner? If you have a reason, whatever the reason is, sharing it will help in the long run. Apologies are important, but so are reasons. Explain your actions and your feelings to your partner and it will be easier for her to accept. A major part of an apology is to listen. Though it is important for you to express your feelings, decisions, and explanations, it is equally as important to let your girlfriend express hers. Talking over a person, or prioritizing your emotions and feelings, will not get you anywhere. Once you have said your words, let your girlfriend talk back with you. Her feelings are as important (or maybe more important) than yours. Not everyone is able to process an apology quickly. If your girlfriend needs time to think about the situation—including your speech—you should let her have that time. If your girlfriend requests time away from you, or time to process her feelings or your apology, respect that. Time is a major key in acceptance. Gifts can be hokey, so be careful. If you and your girlfriend are in the middle of a small and unimportant bickering battle, a gift might be nice. If you are relying on a gift to say “I’m sorry” for you, better rethink your decision. Flowers are always nice, though. Some people process better via the written word. If you are a writer rather than a speaker, write an apology letter to your girlfriend rather than attempt to stumble over your words. If your girlfriend is a reader rather than a conversationalist, do her a favor and write her an apology letter instead. Giving someone the right way to process is one of the nicest things you can do. It might end up being more effective as well. Because of these modern times, a text message can work as well as a handwritten letter. Text messages are nice because they are convenient and quick. 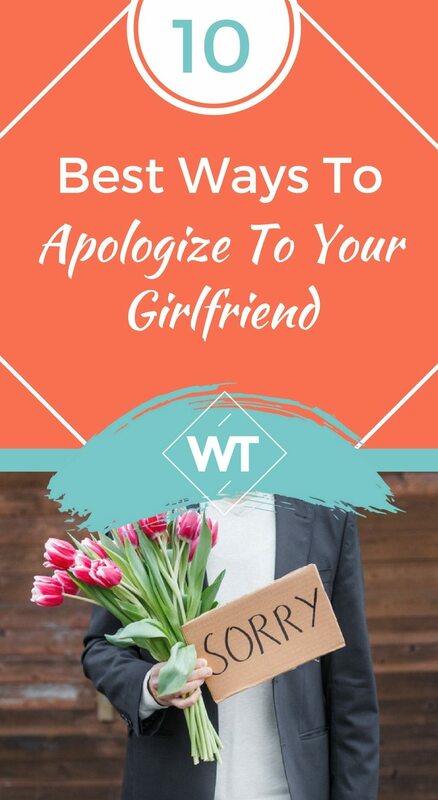 Instead of waiting until the next time you see your girlfriend, you can apologize immediately instead. Why wait and let an argument fester when you can shoot off a quick text message and help ease the pain? Avoiding responsibility is not going to help your girlfriend process the situation. Before you apologize, or while you apologize, make sure you are accepting responsibility for whatever part you played in the argument. Saying “I know I upset you when…” is a great way to begin a true apology. No one appreciates a fake “sorry.” If you genuinely mean that you are sorry—if you truly wish to apologize—make sure you let it be known. Being genuine is one of the best, most effective ways to apologize. You cannot truly apologize without being genuine, so this lesson is not as much of a command as a guideline. Being genuine is important, in all aspects of your life. Couples fight, and that is okay. If it comes to a place where you need to apologize to your girlfriend, make sure you are genuine, kind, and direct. Saying “I’m sorry” can be difficult for some people—try not to be one of them.